Let's leave aside the silliness of this Oprah-level sentimentality, which I have no doubt Friedman does not even believe (wasn't this part of the reason that Friedman disliked Bush--that the latter acted "from the heart"?). 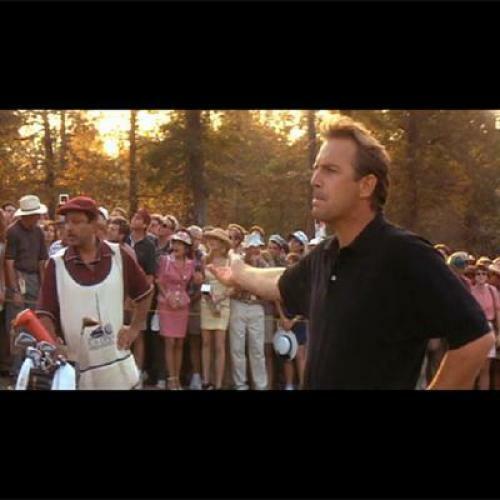 The real problem is that Tin Cup has the dumbest "message" of any movie I can remember. The plot involves a screwed up golfer, played by Kevin Costner, who gets a chance to compete in the U.S. Open and simultaneously win the love of Rene Russo. On the verge of victory (and fame and fortune), he takes a risky shot that he has been told to avoid, and his ball lands in the water. He takes the shot again and again, each time landing in the lake, until he finally sinks it from 200+ yards. Thus, even though he has sabotaged his lifelong dream, he did it "his way." He didn't take anyone's advice. He didn't play it safe. The moral of this story would be sinister enough if followed by non-politicians, but in a political context it is even more slippery. And the analogy to budget debates is not the one Friedman thinks he is making. The eponymous, annoyingly-named Costner character is actually more analogous to Congressional Republicans, who refused to compromise, refused to listen to more neutral observers (economists, in this case, rather than golf experts), and ended up almost leading the country to default. In other words, do not always follow your heart, and do not rent Tin Cup.